I've read one of Emma Newman's books before, Planetfall, and I hated the ending. (Review here.) Because of this, I hesitated over bringing this book home from the library. I finally decided to take a chance on it, and I'm glad I did, as this is a stronger novel in every way. These books (there is a second in the series, After Atlas, which I've yet to read) follow the same storyline but focus on different characters. The setting in this book is the Mars colony, Mars Principia (also the name of the colony's AI), and the characters are its inhabitants (five). Our main character is Anna Kubrin, the geologist/artist in residence, sent there by the corporation that owns and operates the colony. In this future, corporations have taken over the world's governments, and own (pretty much) the entire population of Earth. One's value as a human being depends on how high up one climbs in the gov-corp. This story is a pretty neat little puzzle box of a mystery, with some very interesting things to say about motherhood, postpartum depression, and how society treats women who become mothers. Anna was basically tricked into having her one child (by her needy, egotistical little prick of a husband) and knows she does not love her daughter Mia as she thinks she should. It's a viewpoint I've rarely seen expressed in fiction, and a lot of it was apparently based on the author's real-life experience. Anna is a well-drawn character, with realistic flaws and depth. But there are also larger themes in this book, themes of privacy and human rights, and a chilling backstory where the gov-corps have destroyed democracy. All these things come to a climax in a stunning plot twist about three-fourths of the way through the book, and the aftermath deals with Anna and her fellow colonists picking up the pieces and going on. This book is a little bit on the nose with the current world climate, and as such is not a comfortable read. But it ends with a tiny, fragile hope for the future. Highly recommended. 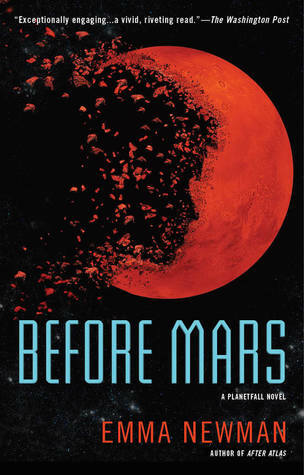 Sign into Goodreads to see if any of your friends have read Before Mars.